Paul includes this text in his defense of the resurrection of Jesus of Nazareth, which would have taken place about twenty years prior to his letter to the Corinthians. There were apparently already murmurs circulating in the Corinthian church, a dispute as to the reality of the resurrection. Why is this text considered a creed, and why is that important? What constitutes a creed? A creed is a formal belief statement. The passage above, 1 Corinthians 15:3-7, is a pre- Pauline belief statement of the first century church. How do we know? First of all, Paul clearly states that he is delivering a word that he received; as a writer, this is an important note, stating, “Hey guys, this is not my original work.” In a reverent tone, he also describes it “as of first importance.” In essence, the church in Corinth ought to listen carefully to this voice of authority, which is even greater than what the apostle Paul himself could have produced. Another indication that this text is a creed is its parallel style. Notice the language, “that Christ died…that he was buried…that he was raised…that he appeared.” This parallelism is purposeful and points to the creedal nature of the text. Additionally, the rhythmic structure aligns with an oral tradition, which was common in the first century Jewish culture; in fact, oral tradition is the method by which Jews learned and studied the Torah. Due to its rhythm, style, and due to Paul’s note of receiving and delivering, the passage is considered a pre-Pauline creed. 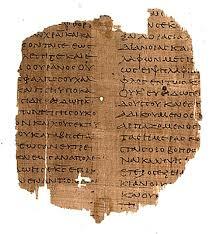 Now that we know Paul did not write the creed, where did it originate? Although scholars disagree, a solid case affirms that it originated in Jerusalem during the very first years of the Christian church. In another letter, Paul recounts his visit to Jerusalem. “Then after three years I went up to Jerusalem to visit Cephas and remained with him fifteen days. But I saw none of the other apostles except James the Lord’s brother.” Ironically, Peter and James are specifically listed as eyewitnesses in the creed. Paul converted to Christianity in AD 32, meaning he received the creed from Peter and/or James three years later (AD 35) in Jerusalem. While some disagree about its Jerusalem origin story, the creed was clearly fashioned for a Jewish audience. Terms like Christos and the scriptures indicate Jewish concepts of the awaited Messiah and the Jewish scriptures (modern-day Old Testament). The use of Cephas instead of Peter also indicates a familiarity with him as well as with Aramaic, the spoken language of the Jews at the time. The creed’s particularly Jewish usage of language, paired with Paul’s visit to eyewitnesses in Jerusalem, point to its probable Jerusalem origin. For New Testament scholars, this creed is monumentally important. It originated within five years of Jesus’ resurrection. It was delivered by eyewitnesses. And it was held in high regard by Paul “as of first importance.” Cumulatively, the 1 Corinthians creed is one of the most historically accurate pieces of the New Testament. Whether or not you believe in the resurrection of Jesus, there is one fact: the earliest church did. According to the creed, the earliest church preached the exact same gospel Christians maintain to this day. They believed Jesus of Nazareth was the Christ according to the Scriptures—the long-awaited, prophesied Messiah and King of Israel. They believed, better yet, witnessed, his death by Roman crucifixion, a well-attested historical event, and his burial. He was really dead. But then something happened that changed everything for the apostles and the other witnesses: they saw Jesus in the flesh after his death. They proclaimed his resurrection; they didn’t invent or dispute it. In fact, it was the very catalyst that transformed them from uneducated, terrified-of-the-Romans laymen into bold preachers of the resurrected Messiah. The seven simple verses in 1 Corinthians 15 are an invaluable piece of history. The creed, originating within 5 years of Jesus of Nazareth’s death and alleged resurrection, leaves no room for legendary embellishment. The earliest church in Jerusalem, and later spreading throughout the known world, believed that Jesus rose from the dead. In the modern era, people often find it difficult to believe that God would raise someone from the dead. A vital point to consider, however, is what the eyewitnesses themselves believed and recorded. It’s unscientific to throw out evidence because we find it difficult to agree with. We must allow history to speak for itself.